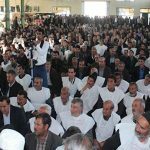 Isfahan farmers in a sit-in demanding their water rights. Dressed in white, they symbolize their readiness to sacrifice their lives in order to obtain their water right. Iran is facing a water crisis that affects people in provinces across the country and shows no signs of improving. The MEK previously referred to the water crisis as one of Iran’s super challenges, and it is one of the many problems facing the country that has resulted from the mullahs’ corruption and mismanagement of Iran’s wealth. People in Iran’s central and southern provinces and the southeastern province of Sistan and Baluchestan have been the hardest hit by the water crisis. Isfahan Province, in southern Iran, has been affected the most deeply by water shortages. The province’s primary industry is agriculture, and farmers in the region no longer have water to irrigate their crops, due to the drying of the Zayanderud River, Iran’s largest river. The Zayanderud used to provide a plentiful water source to the farmers of Isfahan. Then the IRGC began building factories upstream of Isfahan and diverting water from the river to support their regime-supported businesses. The once-prosperous Isfahan farmers were left without water to irrigate their crops or a means to support their livelihoods. Virtually everyone in Isfahan relies on agriculture for their livelihood. In the Khorasgan district of Isfahan, the overwhelming majority of the district’s 300,000 residents support themselves through agriculture. The loss of water rights has led to a series of anti-regime protests and demonstrations over the past year. The same is true across Isfahan Province. In the past, the regime has made promises to address the concerns of the farmers, but little to nothing has actually been done to follow through with these promises. At one point, the regime offered to pay the farmers a portion of the damages they have sustained in order to end their protests. The offer was so insulting it led to more protests. According to the state-run ILNA news agency: “What has further enraged the farmers is the proposition to pay 5 million rials in exchange for 14-15 months of not having been able to plant anything.” The proposition amounted to approximately $50 for a year’s worth of damages caused by the regime’s policies. The farmers of Isfahan are protesting for the right to do their work and for the fundamental human right to access water. The fact that they have spent months protesting for water rights points to the larger issue facing the Iranian people. the mullahs have brought Iran to the brink of collapse through their corruption and mismanagement of the country’s resources, and they have neither the will nor the ability to address the problems they have created. 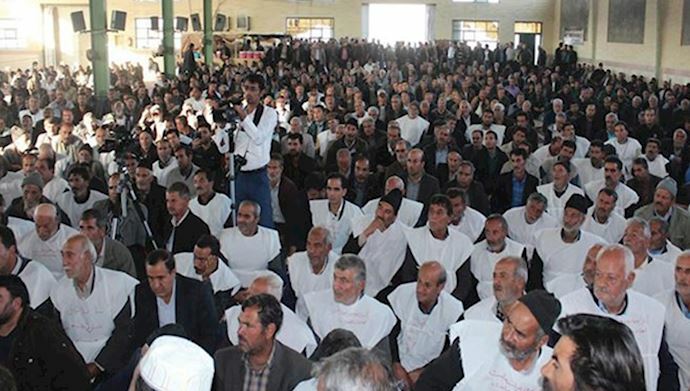 The farmers of Isfahan have gained widespread support for their protests, and many other sectors of Iranian society have also joined the ongoing nationwide strikes and protests that began almost a year ago. It has become abundantly clear that the regime is failing the Iranian people and that a change is necessary. The people are ready to control their own destinies.